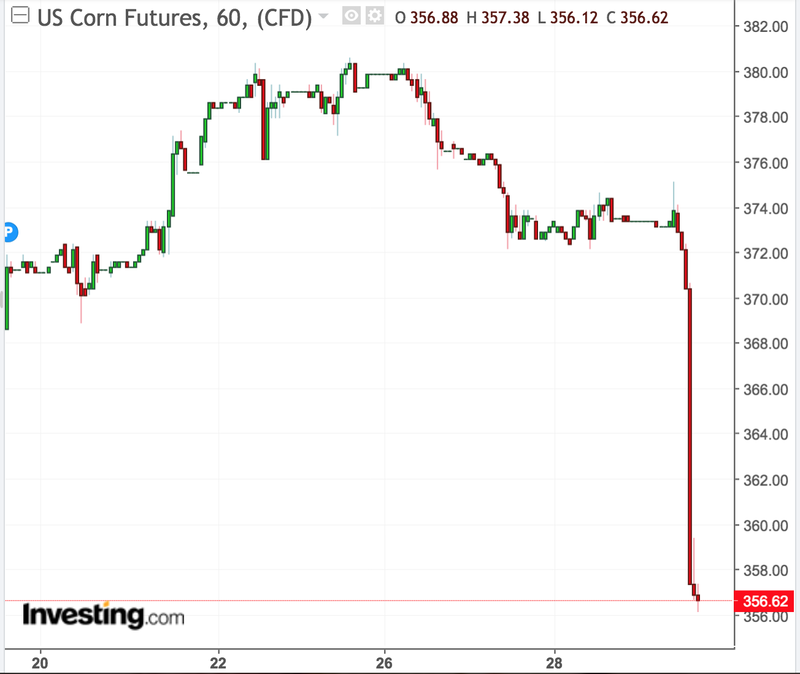 Corn futures plunge more than 4% after bearish USDA report. Corn volume exceeds 1,000,000 contracts, leading to rapid sell-off. Soybean and wheat futures finish the last trading day of the quarter in the red, weighed down by corn. Wheat turns even more bearish with a 29-cent CBOT-KCBT spread. 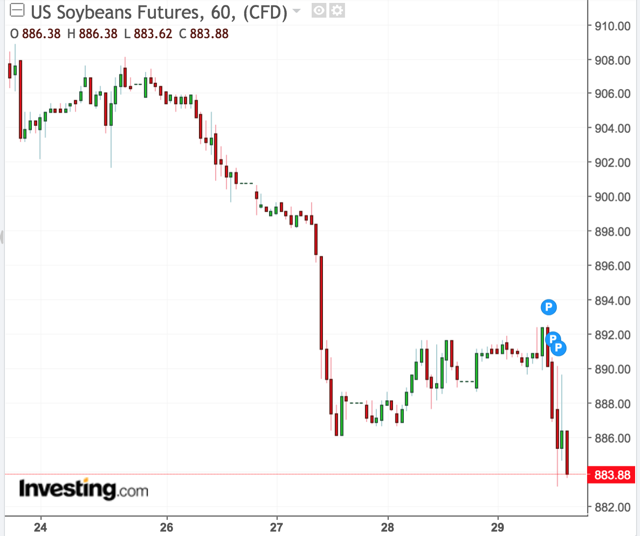 After Friday’s United States Department of Agriculture (USDA) report, soybeans proved to have the most upside with a not-so-bad report, U.S.-China trade optimism combined with showing strength during the trading session, weighed down by corn but finishing slightly lower. Wheat continues the downtrend with an increase in domestic supply and no issues of global shortage. Trade talks and the flood situation across the Midwest and Plains are worth keeping an eye on still moving forward. On Friday, corn futures plunged more than 4% on the last trading day of the quarter after a bearish USDA report led to heavy selling of the grain. Ultimately, this weighed on the broader grain market, as wheat and soybeans finished in the red as well. U.S. May corn futures finished down 4.39% to $3.5662. U.S. May soybean futures closed the day down 0.58% to $8.8388, and U.S. wheat futures down 1.00% to 4.5938. For the less volatile, un-leveraged Teucrium ETF grain products, the Teucrium Corn ETF (CORN) closed for the last trading day of the quarter down 3.85% (-$0.61) to $15.23, the Teucrium Soybean Fund (SOYB) down 0.51% (-$0.08) to $15.75, and the Teucrium Wheat Fund (WEAT) down 1.49% (-$0.08) to $5.29. May Chicago Soft Red Winter Wheat (SRW) futures this morning are down 5.2 cents to $4.592, with May Kansas City Hard Red Winter Wheat (HRW) futures down 8.2 cents to $4.304, resulting in a 29-cent premium of CBOT wheat to KCBT wheat. MGEX's Hard Red Spring Wheat (HRSW) May contract is down $0.76 to $5.600. The USDA released its report at 11am CDT. The USDA crop report showed corn stocks of 8.605 billion bushels, down from 8.892 billion bushels. Regardless of the lower inventory estimate, it was still much more aggressive than the average consensus amongst analysts of 8.309 billion bushels. The USDA also showed in its report that the 2019 corn acreage will top 92.792 million acres this year, surpassing last year’s acreage of 89.1 million and moderately above consensus estimates of 91.3 million acres. The USDA estimated that soybean stocks will climb significantly this year, from 2.109 billion bushels in 2018 to 2.716 billion bushels. The estimate fell very close in line with the consensus expectations of 2.723 billion bushels. In terms of acreage, the USDA expects a drop this year compared to last year, going from 89.2 million acres to 84.617 million acres. The estimate came in smaller than what analysts were expecting, with an average trade guess of 86.2 million acres. As for wheat, the USDA expects for a rise in the stock going from 1.495 billion bushels last year to 1.591 billion bushels this year. That’s also higher than average expectations of 1.551 billion bushels. Acreage across the board (durum, winter, and spring wheat) are expected to decline moderately this year, from 47.8 million acres in 2018 to 45.754 million acres. This comes in slightly short of analysts' expectations of 46.9 million acres. Overall, the numbers weren’t too bad for soybean and wheat. In fact, soybeans could have come in positive for the day after reporting a rise in inventory and a decline in acreage. After the USDA report came out, soybeans retracted some of their loses and traded slightly lower for a good portion of the afternoon. Corn, with a massive volume of 1,009,921 contracts combined with the bearish numbers, weighed heavily on the entire grain market. 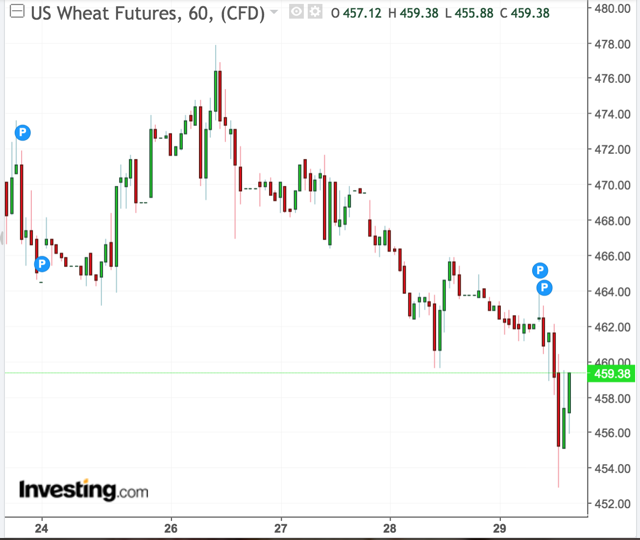 Rising wheat stocks continued to apply downward pressure on the prices of wheat. 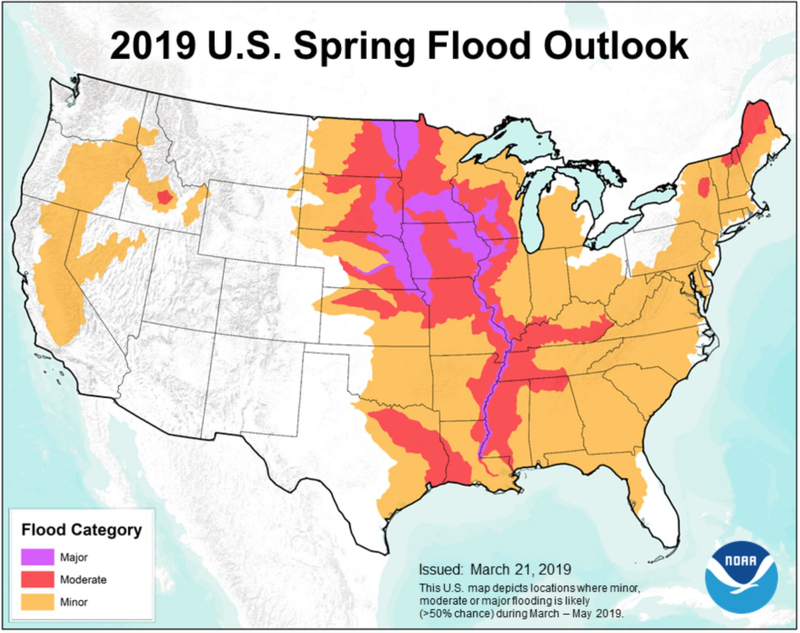 On the weather front, flooding continues to be a major player with regard to the grains (corn, soybean, and spring wheat, in particular), as I’ve mentioned in my last article. On the trade front, there’s optimism on the U.S.-China trade negotiations after U.S. Treasury Secretary Steven Mnuchin mentioned that talks between the two countries have been “constructive”. Meetings took place this week in Beijing and will continue next week in Washington, D.C.